With great power comes great responsibility? Details concerning the time period between Norman's youth and his adulthood are sparse. However, there are a few facts from various stories that give us some insight into Osborn's early years. For instance, Norman tells Otto Octavius in Superior Spider-Man Team Up #11 that he and his wife Emily were childhood sweethearts, so the presumption is that Emily and Norman met when he was relatively young. In Untold Tales of Spider-Man #25, Harry Osborn tells Gwen Stacy that Norman is an alumnus of Empire State University. It is unclear whether Emily Osborn attended Empire State University alongside Norman. 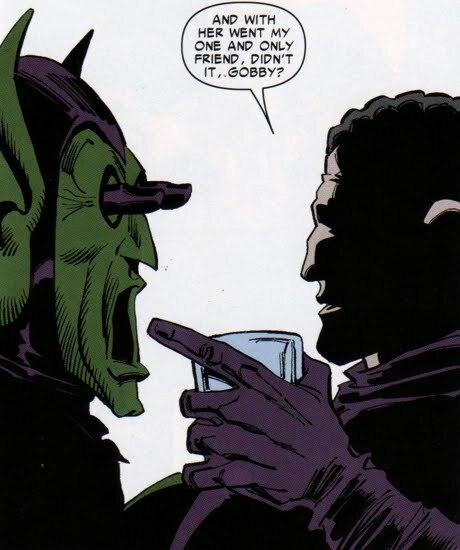 During the events of the Revenge of the Green Goblin story, Norman recounts the tragedy that was his marriage. He implicates Harry's birth as a possible cause of her death, but no specific details as to the cause of her death are mentioned. But one thing is clear, Norman loved Emily greatly. He says that they had "such plans [together]" and that he never felt "as whole--as balanced--as when he was with her." Her death changed everything for Norman, and he began to refocus on his goal of obtaining wealth and restoring the Osborn family name. In Amazing Spider-Man #40 we see different ramifications of Emily's death, namely Norman stepping into single parent hood. Even though Norman was the sole parent to Harry, Harry was second to Norman's goal of attaining wealth and power. Norman claims that Harry didn't have "anything to complain about! The more money he made, the more presents [he] bought him!" Clearly Norman was successful in his business, but he did not spend much time with Harry, he just showered him with material things. Even the material gifts themselves were bittersweet, and traumatic, at times. In Amazing Spider-Man Extra #3, Harry recounts a particular incident where Norman had just bought him a brand new bike in order for him to learn how to ride it. The two bonded over the success Harry has in learning to ride, the pride he senses from his father went a long way to make him feel good about himself. But soon after, Harry is swindled by some neighborhood kids who steal the bike from him. Harry is ashamed of himself and eventually he tells his father about what had happened. Norman and Harry hop in the car, and when Norman spots the kids he goes after them with a baseball bat. After yanking the boy off of the bike, he smashes the bike with the aluminum bat. Norman leaves the smashed bike in the road and turns to Harry to say, "you see what happens to your nice things when you don't take care of them." Needless to say, events like this had a massive impact on Harry's mental state as a child and an adult. For an interesting side note, the bike from Harry's story could be the same brand new red bike that Norman recalled during his identity-unveiling back in Amazing Spider-Man #40. 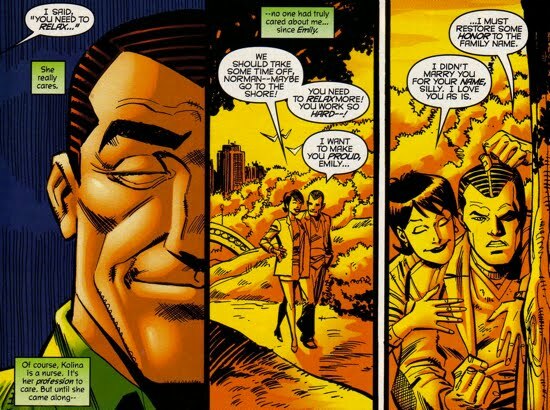 Harry was not Norman's primary focus and Norman explicitly states in Revenge of the Green Goblin #1, that gaining an heir was not a fair trade for losing Emily. The seeds for Norman's mistreatment/resentment of Harry were planted when Emily died. Later, during Norman's Dark Reign, James Rhodes (aka War Machine) forced Norman to recall one his fond memories in order to persuade the villain Ultimo that life on Earth was worth saving. Norman, albeit reluctantly, recalled the birth of his son Harry in War Machine (V2) #9. To be honest, it is not very clear as to why Harry's birth should be such a positive memory for Norman, because Emily died shortly thereafter and that her death was associated with Harry's birth. I would contend that Harry's birth would be a negative memory...however, stealing Peter Parker's newborn would be a positive memory. More information regarding the timeline of Emily's death was shared by Norman during his all-too-brief team up with Doctor Octopus in Superior Spider-Man Team Up #11. That full story is covered here. 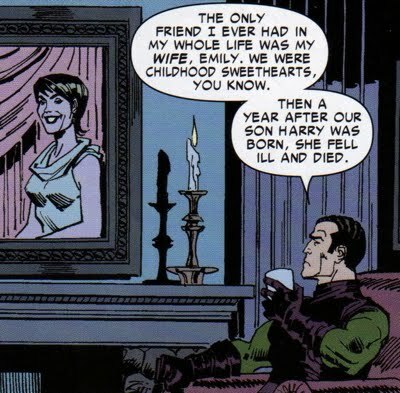 Osborn states explicitly that she died a year after Harry was born. That's an important point of clarity because there was some speculation that she had died giving birth to Harry (which was at odds with some of the other details we've seen on Emily). 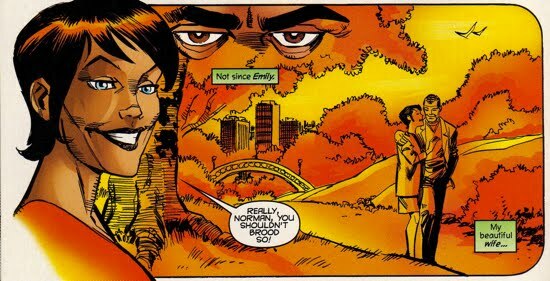 Norman also reiterated just how much she meant to him stating about her death that, "with her went my one and only friend..."
Moreover, in Spectacular Spider-Man #180, Harry flips through a photo album that has pictures of Emily, Norman, and him when he was a child. Harry is depicted in those pictures as being roughly 1 year old. Which confirms Norman's recount in Superior Spider-Man Team Up #11. 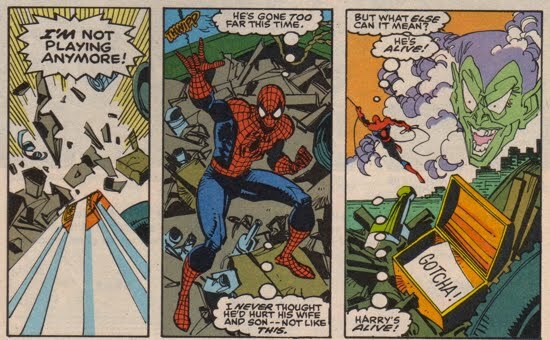 Emily was also referenced by Harry during one of his numerous "posthumous" attacks on Spider-Man (posthumous in quotation marks since we know Harry wasn't really dead) in Spectacular Spider-Man #204. 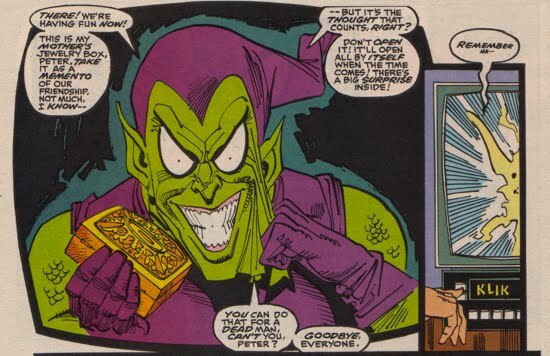 Whilst issuing his last will and testament (in full Green Goblin attire), Harry leaves his mother's jewelry box for Peter as a 'memento of [their] friendship'. Peter, obviously suspicious, doesn't know what to think about the gift. Eventually, guided by his spider-sense, Peter opens the box and finds nothing but a classic Harry "Gotcha!" We learn Emily's maiden name in Amazing Spider-Man (Vol. 4) #3, after Harry returns to New York (he had moved away from the city to raise his son Stanley whilst using a fake name/identity). For more on that see here and here. Harry returned to help run Parker Industries and upon his return he changed his last name to his mother's maiden name, Lyman. 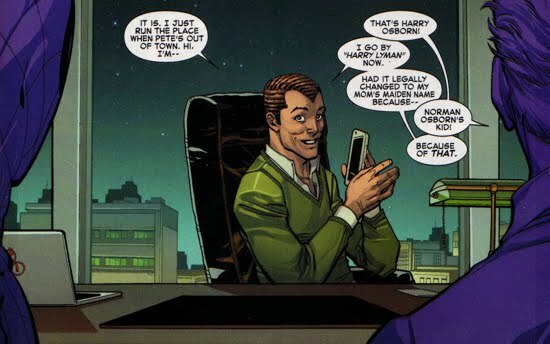 Harry paid homage to his deceased mother and, more importantly, rejected his father by dropping the name Osborn. 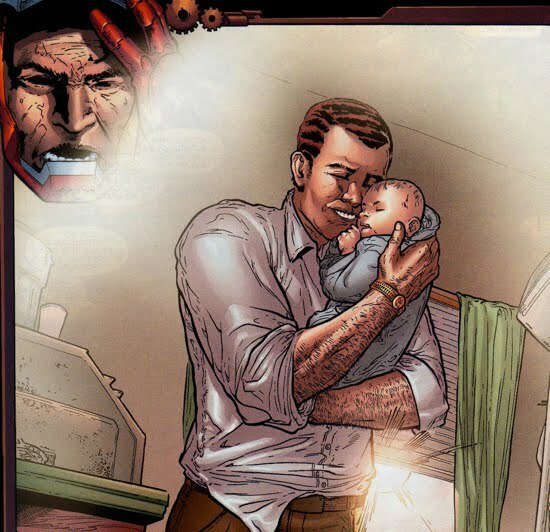 In Amazing Spider-Man #799, the Red Goblin (aka Norman Osborn) reveals to Harry and Liz that their nanny, Emma, is actually Harry's long-thought-dead mother Emily Osborn. As this story develops, this page will be modified.